View Tameson’s selection of manual butterfly valves as they are a cost-effective solution for on/off operations as well as modulating the flow. They are simple and easy to understand as they operate by means of having a rotating disc to control the flow. They are controlled manually either by a handle with a locking lever or gear wheel for easy operation. Their body design is typically either a lug or wafer style allowing for quick connection to a system while offering a smaller construction length compared to other quarter-turn valves of the same diameter. The disc design is typically concentric (turns in the middle of the flow), but can also be designed to be eccentric (offset) based on the needed seal and wear requirements. With a wide array of housing, disc, and seal materials, you can select the right combination for your application’s media and environment. They can be used for liquids, slurries, and gases that are hazardous and non-hazardous within a wide temperature range. 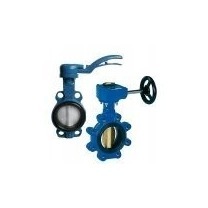 A butterfly valve is often selected over other quarter-turn valves, like ball valves, due to their lower cost and size for the same diameter size.